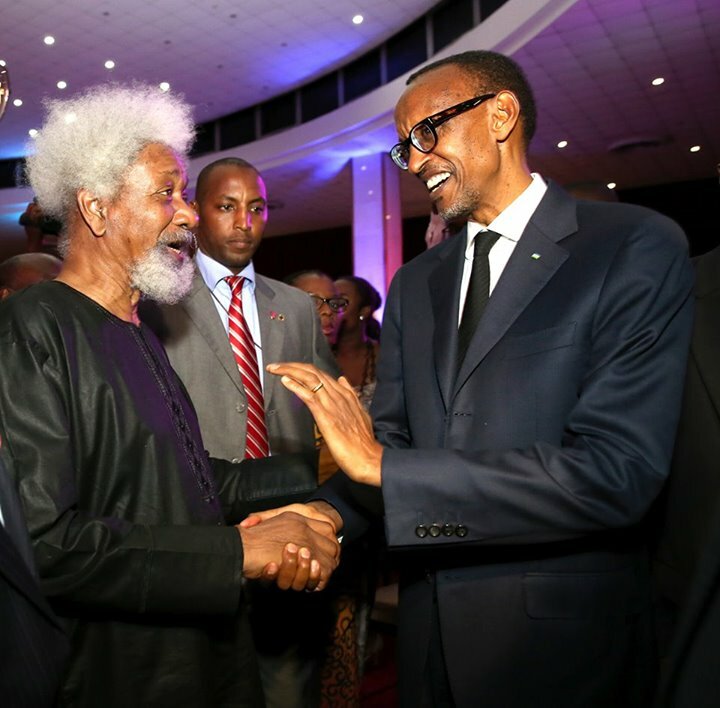 Wole Soyinka meets President Paul Kagame. Wole Soyinka; the guy is turning 80 this year and doing it in style. Last week he gave a few bob to the winner of the literary prize with his name Akin Bello. Then just last night he launched Crucible of the Ages- Essays in Honour of Wole Soyinka at 80 by Ivor Agyeman-Duah and editor Ogochukwu Promise in Accra, Ghana. The launch of Wole Soyinka’s book is organised by the Lumina Foundation, Centre for Intellectual Renewal and Global Media Alliance. It is part of a series of Global Literary festivities to mark the eightieth birthday of Africa’s first Nobel Laureate in Literature. The evening was a star studded affair with folks like Ghanaian President John Mahama, former President of Ghana John Kufuor and former Commonwealth Secretary-General, Chief Emeka Anyaoku milling with the rest of the people. The keynote address was given by President Paul Kagame of Rwanda who is clearly a fan. “Throughout his life, Wole Soyinka’s enduring contribution has been to call attention to the difficult work of liberating the mind. He has been an unapologetic exponent of the universality of African values. He will remain a beacon for African young people,” the president said. Now that’s how you turn 80! You can check out more images of the event on President Kagame’s Flickr page here.